FOX Sports North and Minnesota United FC announced a new multiyear programming agreement Thursday, beginning with the 2018 season. For the first time, FOX Sports North will add MLS soccer to its pro sports television lineup and serve as the exclusive, local television home for the Loons. 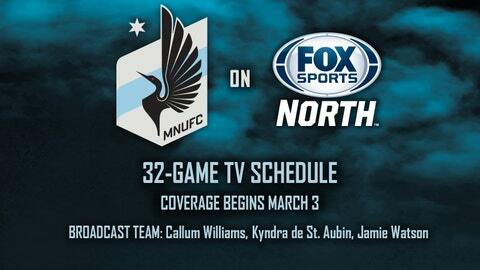 FOX Sports North’s 32-game broadcast schedule begins March 3 as Minnesota United FC takes on the San Jose Earthquakes in its season opener. All matches will be streamed live on FOX Sports GO and include Loons Live, a 30-minute pre- and post-match show. Additionally, all matches will be simulcast on FOX Sports Wisconsin, extending the team’s reach to an additional 1.5 million homes in the Upper Midwest. The regional sports network’s lineup includes 17 home matches from TCF Bank Stadium and 15 on the road this season. A total of 13 will be presented on FOX Sports North PLUS with the matchup vs. the New York Red Bulls on March 24 available exclusively via FOX Sports GO. The broadcast team for Minnesota United telecasts on FOX Sports North will feature play-by-play announcer Callum Williams and Minnesota native Kyndra de St. Aubin as color commentator. Jamie Watson will serve as the club’s sideline reporter and analyst. “We are thrilled to add the Loons to our pro sports programming lineup and proud to work with Minnesota United to deliver this exciting lineup of games to fans all across the Upper Midwest,” said Mike Dimond, senior vice president and general manager of FOX Sports North. March 3 Saturday at San Jose 9:30 p.m.
March 17 Saturday Chicago 1 p.m.
April 14 Saturday at Portland 9:30 p.m.
April 28 Saturday Houston 7 p.m.
May 5 Saturday Vancouver 1 p.m.
May 9 Wednesday at Los Angeles FC 9:30 p.m.
May 12 Saturday San Jose 1 p.m.
June 23 Saturday at Colorado 8 p.m.
July 7 Saturday at Houston 8 p.m.
July 14 Saturday Real Salt Lake 7 p.m.
July 18 Wednesday New England 7 p.m.
July 22 Sunday Los Angeles FC 6 p.m.
Aug. 11 Saturday at LA Galaxy 9:30 p.m.
Sept. 12 Wednesday at DC United 6:30 p.m.
Oct. 6 Saturday at Philadelphia 6:30 p.m.
Oct. 13 Saturday Colorado 1 p.m.
Oct. 28 Sunday at Columbus 3:30 p.m.